Quotes from important persons in Liverpool Football Club inspires. They tell everything about the spirit in the city and are the powerful words that really create magic. Inhabitants in Liverpool are devoted completely to football, but it`s even more than that: it`s a way of life, a religion and a burning passion. Photo. The symbol of victory for Liverpool Football Club, of Bill Shankly, stands outside Anfield Road in Liverpool. © Travel Explorations. People`s actions in Liverpool are rooted in his heart and hard beating comments. 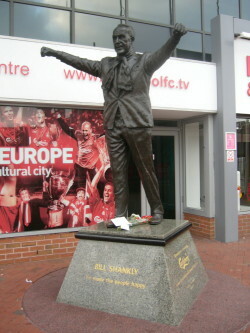 The statue on the photo is of the legandary Liverpool manager Bill Shankly (2 September 1913 – 29 September 1981). He was one of Britain's most successful and respected football managers. Shankly played nearly 300 times in The Football League for Preston North End and represented Scotland seven times, as well as playing for Partick Thistle and Carlisle United. His brillant comments and fighting spirit will never be forgotten. With the spirit of the legendary Liverpool manager Bill Shankly, Liverpool goes on. Once Shankly said: "My idea was to build Liverpool into a bastion of invincibility," he said. "Napoleon had that idea. He wanted to conquer the bloody world. I wanted Liverpool to be untouchable. My idea was to build Liverpool up and up until eventually everyone would have to submit and give in." For over 20 years ago I realised my big dream from the childhood: going to Liverpool first and foremost to experience football, but also to enjoy Merseyside beat music and meet the nice people Gerry Marsden sings about in the song Ferry Cross the Mersey. Intoxicated by the unique atmosphere on the Kop at Anfield Road, beautiful music and people`s good spirit I dreamed about going back. In Liverpool I lost my heart heart and soul. Based on my strong impressions in Liverpool I could easily understand why Liverpool Fotball Club has become so successfull over so many decades. It`s all about spirit, having the right attitude, expressed through comments and shown through hard work. It`s so much wisdom and attitude in the comments from former Liverpool managers, especially from the mentioned Bill Shankly. These strong words reflect both how the players play and how people in Liverpool act. They are really something. Photo. The Liverpool logo on the wall at Anfield Road. Photo. 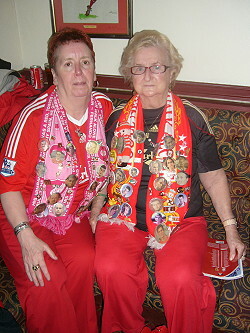 Two eager and well decorated supporters in Albert Pub, near Anfield Road, Liverpool`s football stadium. The Liverpool supporters keep up their good spirit! Nothing can`t compares with the unique atmosphere at The Kop, especially not when the audience sing You`ll Never Walk Alone. It sends shivers down my spine and I get tears in my eyes. It`s so emotional because it`s more than a football song. It`s actually about life in Liverpool, hope for the future and for people supporting each others in good and bad times. The legendary Kop section of Liverpool's football stadium Anfield Road celebrated its 100th birthday in 2006. The Kop, is famous for its entusiasthic audience who encourage their players to performe above ability and frightened the opposite team`s players to death. 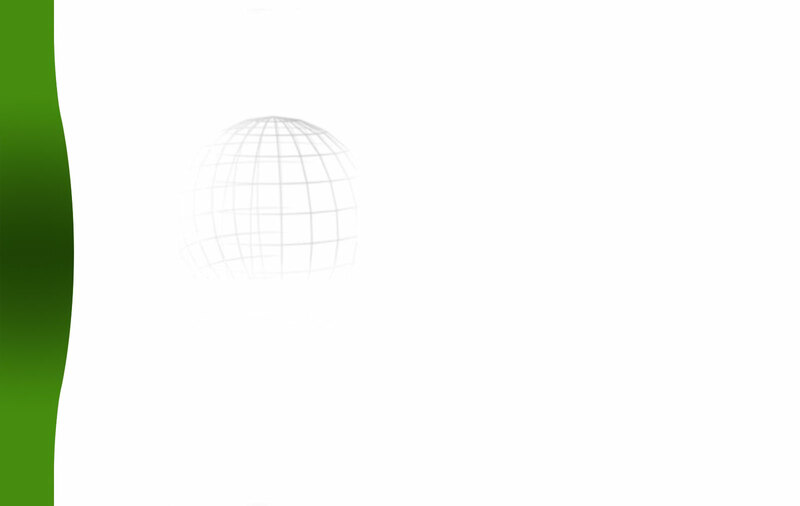 At least so much that they get paralyst and don`t know what to do with the ball. The audience make such a incredible amount of noise that you can hear them all the way to Manchester, and I am holy convinced that the Manchester United supporters don`t like that. The kop was named in memory of the men who died fighting in the Battle of Spion Kop in South Africa during the Second Boer War. Since its construction, the Kop has been the home of Liverpool's biggest and most loyal supporters. Photo. 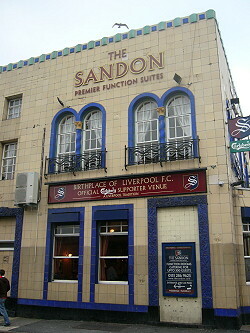 Sandon Pub where Liverpool Football Club was founded 1892. The Kop is Liverpool Football Club`s heart and soul. Experience the Kop it`s like being a part of a big family. I can ensure you; the family bands (links) are strong! To get more insight in the incredible history of The Kop and its importance for Liverpool Football Club, it`s possible to buy it on a DVD: Liverpool FC - 100 Greatest Moments Of The Kop [DVD]. The Liverpool players inspires by walking through the training ground reception, where the European Cup is disayed and the walls are decorated by quotes from the great Bill Shankly. A quote from Shankly at Melwood reads: "Above all, I would like to be remembered as a man who was selfless, who strove and worried so that others could share the glory, and who built up a family of people who could hold their heads up high and say 'We are Liverpool'. Just one last punchline here: As Bill Shankly once said: "The socialism I believe in is everybody working for the same goal and everybody having a share in the rewards. That's how I see football, that's how I see life." With other words: In Liverpool people stay together and support each others. It`s “the Liverpool way”! You`ll Never Walk Alone! Attitude means everything to achieve success! Read more about Liverpool city, football, historical sites, pubs and bars, on our global travel guide Travel Explorations.